JET-PRO® Soft Stretch Digital Transfer Paper produces soft, supple yet vibrant and wash-durable ink jet printed transfers to white and light colored cotton, cotton/poly blends and 100% poly fabrics. The product can be used to apply photographs or other designs and can be trimmed to reduce the transfer of the polymer background. The product can be applied by either a commercial press or a hand iron. 8.5" X 11" JET-PRO® SofStretch INK JET Transfer Paper, a single step transfer paper for making ink-jet transfers on white and light-colored fabrics. This product is compatible with most dye, pigment, solvent and eco-solvent ink-jet printers. Choose garments that have a tight weave. 17in. x 100ft 2" Core; Sold by the roll; JET-PRO® SofStretch INK JET Transfer Paper, a single step transfer paper for making ink-jet transfers on white and light-colored fabrics. This product is compatible with most dye, pigment, solvent and eco-solvent ink-jet printers. Choose garments that have a tight weave. 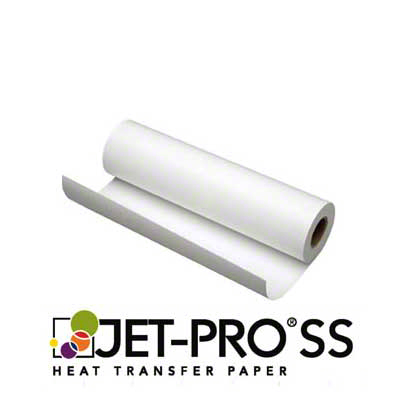 13" x 19"; 100 Sheets; JET-PRO® SofStretch INK JET Transfer Paper, a single step transfer paper for making ink-jet transfers on white and light-colored fabrics. This product is compatible with most dye, pigment, solvent and eco-solvent ink-jet printers. Choose garments that have a tight weave. 13in. x 100 ft with 2" Core; Sold by the roll; JET-PRO® SofStretch INK JET Transfer Paper, a single step transfer paper for making ink-jet transfers on white and light-colored fabrics. This product is compatible with most dye, pigment, solvent and eco-solvent ink-jet printers. Choose garments that have a tight weave. 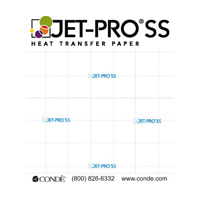 11" x 17"; 100 Sheets; JET-PRO® SofStretch INK JET Transfer Paper, a single step transfer paper for making ink-jet transfers on white and light-colored fabrics. This product is compatible with most dye, pigment, solvent and eco-solvent ink-jet printers. Choose garments that have a tight weave.